Unlike many of the teams that will step on the hardwood in Sin City, the Lakers will field a Las Vegas Summer League squad beginning on July 7 that represents a significant portion of their regular-season roster. They will field their prized lottery pick in rookie point guard Lonzo Ball. Lakers second-year forward Brandon Ingram and second-year center Ivica Zubac will provide encores. The Lakers’ other draft picks in rookie forward Kyle Kuzma (No. 27), shooting guard Josh Hart (No. 30) and center Thomas Bryant (No. 42) will also play. The Lakers announced the rest of their team on Friday, which included two players that had been on the Lakers and Development League affiliate in Vander Blue and former UCLA product Travis Wear. The Lakers will also feature center Alec Brown (Spain), guard Alex Caruso (Oklahoma City Blue of G League), forward PJ Dozier (South Carolina), guard Matt Thomas (Iowa State) and guard Gabe York (Erie Bayhawks of G League). The Lakers will begin practicing on Monday at the team’s practice facility in El Segundo before playing games at the Thomas & Mack Center on July 7 (Clippers), July 8 (Boston) and July 10 (Sacramento). As Southern California News Group previously reported, Lakers assistant Jud Buechler will be the summer league’s head coach, while assistants Mark Madsen, Brian Keefe and Miles Simon will fill the same role. This will mark Madsen’s fourth consecutive stint with the Lakers’ Summer League coaching staff after also serving as the team’s head coach in 2014 and 2015. Lakers assistant Jesse Mermuys was the team’s summer-league head coach in 2016. Fans can purchase tickets for the 2017 NBA Summer League here. 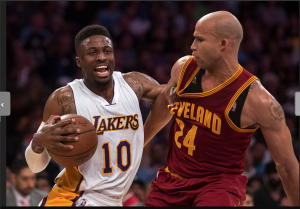 The Lakers exercised a $1.3 million team option that will keep second-year guard David Nwaba for the 2017-18 season. The Lakers had until Thursday to decide whether they would retain Nwaba on a non-guaranteed contract. Nwaba plans to play on the Lakers’ Summer League team in Las Vegas beginning on July 7, which will feature No. 2 pick Lonzo Ball, second-year forward Brandon Ingram, second-year center Ivica Zubac, No. 27 pick Kyle Kuzma, No. 32 pick Josh Hart and No. 42 pick Thomas Bryant. The Lakers became impressed with Nwaba after calling him up from the D-Fenders for a 10-day contract shortly after negotiating a buyout for veteran guard Jose Calderon following the Feb. 23 trade deadline. The Lakers subsequently signed him to another 10-day deal before signing him to a two-year deal. He averaged 6.0 points on 58 percent shooting and 3.2 rebounds in 19.9 minutes through 20 appearances and two starts. Nwaba, who starred at University High of Los Angeles and Cal Poly San Luis Obispo before going undrafted, also impressed the Lakers with his defense and overall hustle, two traits the coaching staff thought the team collectively lacked throughout the season. He previously played with the Lakers’ Development League affiliate, the D-Fenders, where he averaged 14.1 points, 6.9 rebounds, 1.4 steals and 1.0 blocks in 29.0 minutes per game. Lakers second-year assistant Jud Buechler will be the head coach for their Las Vegas Summer League from July 7-17, according to sources familiar with the situation. Buechler joined Luke Walton’s coaching staff last season after playing 12 seasons in the NBA and being a part of the Chicago Bull’s three NBA championship title runes (1996-98). After Buechler attended the University of Arizona under Hall of Fame coach Lute Olson (1986-90), Lakers coach Luke Walton played for the Wildcats from 1999 to 2003. This year’s summer league team will feature No. 2 pick Lonzo Ball, second-year forward Brandon Ingram, second-year center Ivica Zubac, No. 27 pick Kyle Kuzma, No. 30 pick Josh Hart, No. 42 pick Thomas Bryant and second-year guard David Nwaba. Lakers assistant Jesse Mermuys coached last year’s summer league team that featured Ingram, Zubac, D’Angelo Russell and Larry Nance Jr. The Lakers spent the week of the draft restructuring not only its roster, but the leadership of its team on the court. Is the franchise prepared for a quick return to glory, or will the rebuilding process have to continue? Mark Medina, the Lakers beat writer for the Southern California News Group, examines how the Lakers are setting the organization up for future success in the latest “We Want Tacos” Lakers podcast. It includes audio from Lakers president of basketball operations Magic Johnson as well as one-on-one interviews with Lakers guard Jordan Clarkson, Lakers center Ivica Zubac, and NBA TV analyst Isiah Thomas. Thomas, a longtime friend of Johnson and Hall of Fame point guard, offered insight on Ball’s long-term potential after visiting him at his Chino Hills home for a piece on NBA TV. The Lakers have not just made changes to their front office and player roster. They have also made tweaks to Luke Walton’s coaching staff. The Lakers announced the hiring of Miles Simon as an assistant coach, which fills a vacancy stemmed from Theo Robertson leaving after the 2016-17 season for an assistant coaching position at the University of California. Simon had been working with players at the team’s practice facility in El Segundo in the past month, but the details of his contract were still being finalized. Simon recently served as the head coach of the 2017 USA Junior National Select Team for the Nike Hoops Summit. He won gold medals as an assistant for the 2016 USA Men’s U17 World Championship team and 2015 U16 National team. And he also spent three seasons as an assistant at the University of Arizona (2005-08), shortly after Walton played there (1999-2003). “I’m so thankful and blessed to be able to have this opportunity to work for such a great franchise like the Lakers,” Simon posted on his Twitter account. The Lakers said Simon also spent the last nine NBA offseasons working in a player development role. Last summer, he was the Director of the Nike Basketball Academy. Simon, who also played at the University of Arizona (1994-98), played one season for the Orlando Magic (1998-99) before venturing oversees and in the CBA. The rest of Walton’s coaching staff includes associate coach Brian Shaw as well as assistants Jesse Mermuys, Brian Keefe, Jud Buechler and Mark Madsen. Casey Owens is both an assistant coach and advance professional scout. And Clay Moser is both an assistant coach and the director of basketball strategy in the team’s analytics department. It turns out Lonzo Ball’s debut at Staples Center did not entail wearing a purple and gold uniform. The Lakers’ guard appeared with his outspoken father, LaVar, and his younger brother, LaMelo, on WWE’s “Monday Night Raw,” which took place at Staples Center. That outlet gave the LaVar Ball another outlet to do what he does best. He promoted the “Big Baller Brand.” He touted his son’s greatness. And he talked trash. Just imagine when the real games start. The award falls well short of what Lakers forward Brandon Ingram originally expected. After the Lakers selected him with the No. 2 pick in the 2016 NBA Draft, he charted out a goal to win the league’s rookie of the year award. Instead, Ingram made the NBA’s All-Second team and received only 11 first-team votes. Despite leading the NBA’s in minutes played per game (28.8), Ingram ranked seventh in his class in points (7.4), 21st in field-goal percentage (40.2) and seventh in rebounding (4.0). Milwaukee Bucks guard Malcolm Brogdon, who was picked 36th overall, ranked second in minutes played (26.4 per game) while leading rookies in assists per game (4.2) and steals (1.12) and finishing second in three-point field goal percentage (40.4) and free throw percentage (86.5). Still, the Lakers had increasingly liked Ingram’s development enough to consider him untouchable in in trade discussions both leading up to the trade deadline and during the offseason. Despite his modest numbers, the Lakers have optimism with Ingram’s long-term trajectory with his positional versatility, shooting, defense, finishing, post-up game and ball handling. The Lakers have downplayed Ingram’s listed 6-foot-9, 190-pound frame, mindful of Ingram’s skillset and that his body will become stronger with age (20) as well as proper weight training and nutrition. The Lakers also have become encouraged with Ingram’s professionalism and work ethic, two traits that both resonated with teammates and Luke Walton’s coaching staff. Ingram also progressed from a statistical standpoint en route toward becoming the fifth Laker rookie in franchise history to pick up second-team honors, including Nick Van Exel (1993-94), Kobe Bryant (1996-97), Travis Knight (1996-97) and D’Angelo Russell (2015-16). After averaging 7.2 points on 36.9 percent shooting, 3.6 rebounds and 1.7 assists in 39 games off the bench, Ingram posted 11.5 points on 42.3 percent shooting, 4.4 rebounds and 2.9 assists as a starter. Ingram showed more growth in March when he averaged 13.5 points on a 51.7 perecnt clip, 4.1 rebounds, 2.4 assists and 1.0 steals per game in 11 starts. In April, Ingram also cracked double figures in 16 of the last 17 games he played. Follow L.A. Daily News Lakers beat writer Mark Medina on Twitter and on Facebook. E-mail him at mmedina@scng.com. With Magic Johnson at the helm of the Los Angeles organization, it should have come as no surprise that he’d want to draft the most dynamic point guard available. Doing so fulfilled the lifelong wish of UCLA guard Lonzo Ball, who takes over a franchise ready to return to glory. In the latest “We Want Tacos’ Lakers podcast, Lakers beat writer Mark Medina of the Southern California News Group gives his thoughts on Ball’s ascension to the Lakers, with audio from Ball himself, Lakers head coach Luke Walton, general manager Rob Pelinka, and former Laker Robert Horry. EL SEGUNDO — The excitement swept over the Lakers as they selected a hometown point guard with their No. 2 pick that could transcend their franchise with his passing, leadership and marketing appeal. The Lakers did not just feel giddy over drafting UCLA guard Lonzo Ball, fulfilling the expectation that many Lakers fans, opposing team executives, and of course, Ball’s father, LaVar, predicted would happen. The Lakers also believe they at least partially addressed their shooting and defensive needs with what they did throughout the rest of Thursday’s NBA Draft. After trading center Timofey Mozgov and guard D’Angelo Russell to the Brooklyn Nets for center Brook Lopez and the No. 27 pick, the Lakers used that draft selection to secure Utah junior forward Kyle Kuzma. The Lakers then traded their No. 28th pick to the Utah Jazz for the 30th and 42nd selections. The Lakers then drafted Villanova senior guard/forward Josh Hart with the No. 30 pick, and then took Indiana sophomore center Thomas Bryant with the 42nd pick. That left Lakers general manager Rob Pelinka “feeling grateful” for both acquiring additional picks and using those to fill various defensive and shooting needs. While the Lakers lost their two best shooters via trade (Russell) and opting out of a $5.7 million player option (Nick Young), the Lakers have also ranked last in several defensive categories in recent seasons. The Lakers would like to have Paul George. George shares the same feelings. But forming a partnership could become complicated. 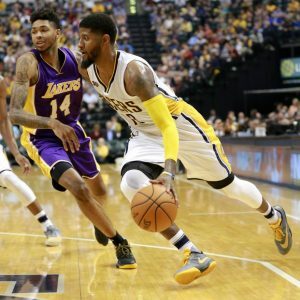 The Lakers have had preliminary discussions with the Indiana Pacers about acquiring the 27-year-old forward and four-time All-Star, according to league sources. But it currently appears challenging the Lakers will reach a deal before the NBA draft on Thursday. Although neither the Lakers nor the Pacers have discussed specifics on a possible deal, the Lakers have gone into these conversations holding firm on two things. They want to keep their No. 2 pick and second-year forward Brandon Ingram, something they have reiterated in previous calls they have both made and fielded in the past month. The Lakers have not entirely ruled out trading their No. 2 pick. Yet, the Lakers like this year’s draft class after having workouts with UCLA guard Lonzo Ball, Kentucky guard De’Aaron Fox, Kansas guard/forward Josh Jackson and Washington guard Markelle Fultz. Though the Lakers have maintained they have kept an open mind about the NBA draft on Thursday, those in NBA circles strongly believe the Lakers will select Ball. He averaged 14.6 points on 55.1 percent shooting and a nation-leading 7.6 assists per game during his lone season with the Bruins. 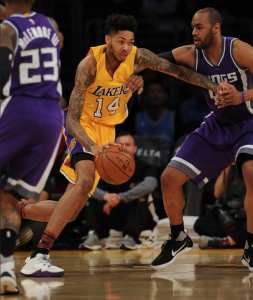 As for Ingram, the Lakers have become most encouraged with his growth among the team’s young players. Although Ingram averaged 9.4 points on only 40.2 percent shooting and has a wiry frame, he has impressed the Lakers with his steady improvement with his positional versatility, defense, ball handling, aggressiveness and post play. The Lakers have also heard from draft prospects that they would like to play with him. Though the Lakers want to hold on to their No. 2 pick and Ingram, it could become complicated trading either point guard D’Angelo Russell or forward Julius Randle. They share the same agent as George’s, Aaron Mintz, who is looking out for his clients’ best interests. All of this leaves the Lakers in a precarious situation. They could wait for George to become an unrestricted free agent in the 2018 offseason in hopes of complementing him with a talented and, at that point, a further developed roster. Doing so leaves the Lakers vulnerable for another team to get involved. According to ESPN, the Rockets, Cavaliers, Clippers and Wizards are among the teams that have talked to the Pacers about George.